Universal fit, carbon fiber air flow and cooling louvers, in both Innie and Outie styles. 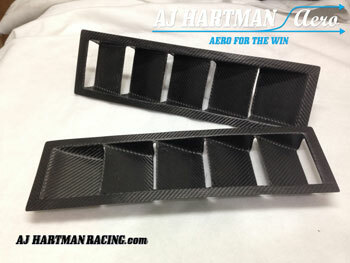 These universal louvers were developed and tested on our in house American Iron race car. They can be utilized to alleviate heat and high pressure under hoods and fenders. The total dimensions with mounting flange is 22" long x 6 1/4" wide. The louvers are 4 3/4" wide and 1 7/8" deep/tall (innie/outie) . They are 100% carbon fiber and are sold in pairs. The final mounting solution is up to the end installer. Good construction ,good finish, good job. From Anonymous of Mos on 2/27/2016 .